On January 29th there was the expected Press Conference of IL VOLO for the presentation of the new CD, MUSICA, and their programs for the year 2019-2020. Many questions are asked during the press conference. There are many journalists and everyone asks questions. Here is the video and then the whole translation. Q = Hi guys I’m here, of course, before talking about Sanremo, I wanted a warm impression of this very important meeting you did with Pope Francis, what a thrill it was, and even sing for this million guys, in short, tell us about your impressions. P = We can say that it was the best way to start our 10 year celebrations. It was a unique opportunity because we are linked to this Pope, a revolutionary Pope, who is very close to the young. We did not believe there was this influx of people, in WYD, in fact, when we climbed the altar, they told us to call it altar and not stage, see these hundreds of thousands of young people so devoted to the church and religion, for us it was a great honor, it was a difficult thing to explain and I think that being a group is a beautiful thing, because we can understand what we feel, all three, being one meter from Pope Francis, involves the management of emotions, because knowing how to manage the emotions at that moment, it’s not easy, but in the end, we manage to metabolize later, the effect of that performance and of that feeling. I = We agree, all right. Apart from what Piero said, on that altar there was a special energy, no matter what we did, it was only putting our talents, our art, in the presence of God at that time. Singing a prayer was a special energy, especially with all people, seeing those guys who were praying, crying, each with their own motivation, was beautiful, a special emotion. G = I want to add that in any case it is the crowning of a dream. You know, it does not happen to everyone, it does not happen often, to have the honor of singing in front of the Pope and we can say that at our age we managed to reach our desire, our greatest dream. P = As Ignazio calls our manager Torpedine “big boss” (because Pavarotti called so, Torpedine), 7/8 years ago I told Michele, “If one day I should sing in front of the Pope, I will call you great boss.” and from today I have to call him that. G = But then, the beauty is that the Pope has remembered us. Presenter = What better start for the ten-year celebrations. Q = A question on Gianna Nannini who collaborated on the writing of the song by Sanremo, your relationship both on the Sanremo track and on the other CD track. G = I do not know if you remember the channel 5 program we did a couple of years ago, House Party? We had the pleasure of dueling with her in “MERAVIGLIOSA CREATURA” and for this reason we decided to make this song, in our style. Then we immediately thought of her, because however as imprinting, “MUSICA CHE RESTA”, is less classic, shows a slight evolution also on our part, on a musical level, also because the production of the record was made entirely by Michele Canova that we salute. Then she immediately accepted, by now, we became friends with Gianna, she gave a touch, slightly more rock, come on. Q = I have two questions, the first is this, you talked about a tour in Japan, you will be in Japan from the 13th to the 18th of May, this means, since the final of the Eurovision is May 18th, which you renounced definitely at Eurovision? P = Can I answer? Torpedine will pay for the flight from Japan to Eurovision ….. or it means we will get back on that date (of the concert) and we will keep going back. I = That, however, is a post-Sanremo problem, first let’s think about the first, there are all the questions you will ask us before Eurovision …. Q = The second question is because of the authors of the festival song, there is no Pasquale Mammaro, who, I do not know if everyone remembers, but he has allowed you to sing “Grande Amore”, which you have made yours, turning it into success that we all know. I = We are interpreters and sing the songs that we like. We heard this song “MUSICA CHE RESTA”, we had tried it a while ago, we were a little dubious, because it was like “GRANDE AMORE”, with some non-contemporary sounds. Then we made the decision to involve Michele Canova and the song has totally changed. We cannot tell you why Mammaro is there, there is not, we are only interpreters, we liked the song and we sing it, regardless of the authors. We were delighted that Gianna gave her contribution, she wrote part of the text …. G = Pasquale presented the text. Presenter = In fact there was an error in the sheet that was given to you, Mammaro appears in the authors, but he is co-editor, not an author, it is an error. P = Sorry Spinelli (journalist), we started half an hour ago, and you ask us the most scary question !! I = The question was pertinent, but we only sing. Q = The colleague asked you about Nannini, I ask you about Barbra, what Barbra told you about this remake (it refers to “PEOPLE” which is included in the new CD). P = We did not talk to Barbra, but we sent her the song a couple of days ago. Our hope, as this year we will, as every year, a special for American TV PBS, we hope to have her in this special, to duet with us. I = She, works more than us (laughter) even Placido Domingo, they never stop. P = PBS is an American private TV, which airs these shows every day, covering 95% of the United States. We were lucky enough to be contacted by them 5 years ago, indeed in 2011, 7 years ago, and in 7 years we have made 6 specials with PBS, and thanks to PBS we make these tours in America. At the beginning our American public met us thanks to this program and then we had the opportunity to participate in other shows. G = If you still see “cover” on this record, which is an international record, it is because, not only PBS, but also our American audience, requires this repertoire, which is a classic repertoire, as do Bocelli, or Groban, or Il Divo, they too follow this musical style. For this reason we decided to put some “covers” on our records, but there are also some unpublished ones, especially for Italy. Q = I would like to return to the Pope’s speech and your relationship with religion, that is, when you went to Mass last time, apart from the WYD? I = Piero answers (everyone laughs). Q = And then if you tell us the thrill of being on a military base, none of you three is in military age. G = It would take a little military life for the youth of today. I = I am very sincere, I do not frequent the church a lot, but not because I do not believe, but because I think that spirituality in us is interior, I have always seen religion as my inner thing, a talk about myself with someone in whom I have faith , in which to believe. And that’s why we tell the WYD, with this enthusiasm, because for me that I do not attend the church, but believing in God, it was a crazy emotion to see these boys, peers, who prayed, closed their eyes, cried. It was touching, even for someone like me, who does not attend church. Returning to the speech of Lebanon, it was great, because being able to spend the Christmas holidays with the men who are at the service of our Country, not only of our Country but are part of the UN for all of Europe, indeed the world, are of heroes. It was moving to discover the lives of these people who are 6 months away from their families, their children, however, yes, a peace mission in Lebanon, but always in a state of alert, anything can happen at any minute, and it was touching. G = These experiences allow you somehow to be a better person, especially at our age, so we are honored to have been among them, even if for a few days. We are growing and these things help us to improve our point of view, as people. Q = I have two questions. The first concerns the fact that they will be guests of Sanremo, Bocelli and his son, you will be able to be on the same stage as a gentleman who I imagine has inspired you a lot. Will you meet him? Do you want to talk with him? Have you already met him? I’m interested in your knowledge with Bocelli. The second question, I want to know how many titles you have discarded to get to the “MUSICA” title? P = With Bocelli there is a wonderful relationship, because we had the opportunity to sing together at the Domingo concert at the Bernabeu stadium in Madrid, then we did a duet with him in Milan, singing Granada. He is a nice person, indirectly, we know all the aspects of Bocelli, because having been Torpedine, his manager for 17 years, in these 10 years he told us so much about him. He gave us some suggestions, we made some vocalizations, we esteem him so much. That man can only be estimated. Regarding the title of the CD….. I = I wanted to say ….. you’re right. G = Why sorry, is not original? Why, do not you like it? I = There is an explanation. Because it was not easy to find a title. For us it is difficult, because we have to make a record that collects the tastes of the countries that interest us, that are America, Italy, Latin America, a little all, and the title must be an easy title, that in any language can be pronounced, and so MUSICA is a universal word that in all languages you can say ….. like IL VOLO. And then we wanted to say that this album, MUSICA, for us has a meaning, and is that for us, the choice of these songs, are the maximum expression of our musical tastes. There is “A CHI MI DICE” me that is very close to my musical tastes, more pop, there is a “PEOPLE” and “ARRIVEDERCI ROMA”, which are closer to the tastes of Gianluca, and then there is a “BE MY LOVE” approaching more to Piero’s tastes. So the choice of the songs, unites all, but there are also personal favorite tastes. Q = Another thing came to my mind that I wanted to ask you. In the song of Sanremo, especially at the beginning, it seems that there is a shift from the lyric song, to which you had accustomed us, to something more pop, that is at the beginning you are much more you, sing in a normal way, it seems to me there is a little movement, I only noticed it? I = But in the whole song? Q = No, in the final piece then raise the voices and go back to your lyric that you have got used to, but at the beginning of the song by Sanremo, I seem to find this thing. G = What we try to do, is not to betray what is our personality and what we have built in these 10 years, also because for us it was not easy to pass from children prodigy, to boys, and now to young men with a beard, so it was not an easy process, because generally many children-prodigy, often then do not feel them anymore. So, if there is still feedback from the public, it means that as a formula, it works, which however affects people’s hearts. This is what we have tried to do, to renew ourselves, it is in the growth of an artist, to always renew itself, to try not to always do the same things. For example, we contacted Canova, also to have a slightly more contemporary sound, but also to show, however that we are not exclusively tenors, or that we only sing opera, there is much more. This CD we say, which represents us at 100%. I = To answer you in more detail, until a few years ago we had those who said to us “sing like that”, now they are already several years, we have grown professionally too, before we were young and we needed to have someone who showed us how to do it. 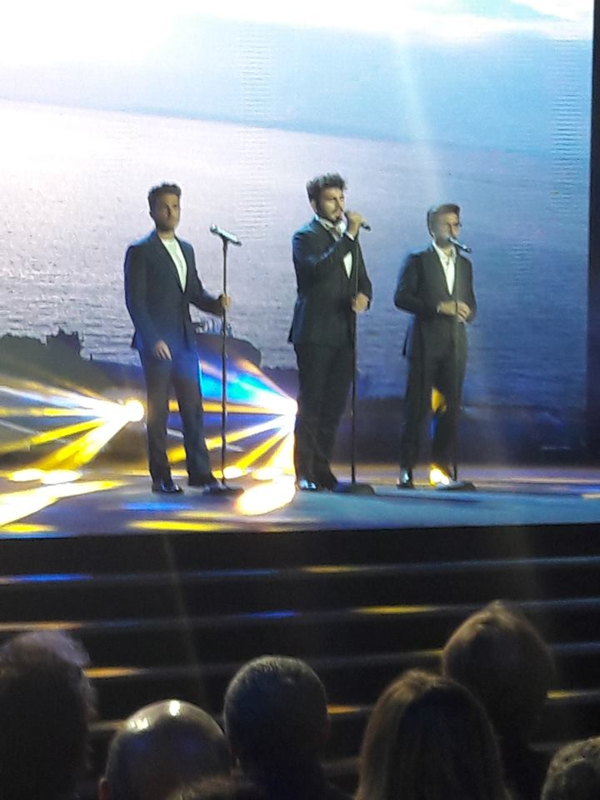 For some years now, we have taken the situation in hand, and we sing in the way that we like, and we are pleased to know that you noticed, was what we hoped for, because the IL VOLO, is not just that of “O SOLE MIO”, but IL VOLO is also this. For this reason we decided to make this album called MUSICA, which includes all three musical genres, is a record that reflects our personality, with a thousand facets. P = All our concerts and trips, made us understand what the public wants from us, what is appreciated by us. Surely outside of Italy, they appreciate Italian music, bel canto, this is obvious. This CD is a map of our travels, because “BE MY LOVE”, we listened to it on one of our journeys in America, North America, in South America, there is “LA NAVE DEL OLVIDO, every year in every album we always record one two tracks also for South America, is a tribute that we also do to South America, the first year we recorded “EL RELOJ”, “EL TRISTE”, in homage to Josè Josè, “HISTORIA DE UN AMOR”, and this year there is “LA NAVE DEL OLVIDO” which is a South American classic and is registered in Spanish. Of this album will be made an entirely Spanish version for South America, because there must be at least 7 tracks to hope for a Grammy nomination. So there are songs for North America, in 10 years we have understood the tastes of the public, but fortunately also match our tastes. Q = Having made a CD with your voices not so high, is a symbol of maturity, ie, the fact of not having to amaze? G = Yes, but also because we realize a bit of what we have done, of what we have built, we try to surprise, but we know that our audience wants this, maybe other singers care more, the text, it’s completely another musical style. We are loyal to our audience, but we also want to expand, try to hit even more people. I = This evolution is not only due to our collaboration, we must say thanks to Michele Canova and to the whole team that worked for this CD. We relied on the hands of Canova, and it is thanks to him and Pino, who makes the mix, that this sound was born, they said. “OK, we make everything younger, everything more pop, everything cooler.” and we believe that the combination of these two things, has brought out something nice, beautiful. G = Also because, you still have to find a compromise, there is nothing to do, a broad appreciation of the bel canto, it is normal that “PEOPLE” and some songs of this CD, will be less listened to, no less appreciated, than the public of the United States or Japan that instead want a slightly more classic repertoire. So you have to find the right compromise. Q = For the song by Sanremo, “MUSICA CHE RESTA”, what is the message that this song wants to express and if any of you have a different interpretation of this message. P = Honestly now we are 25 years old and we see love with a different eye, compared to 10 years ago, or 5 years ago. This year we are more mature, some of us are engaged, so we sing love in a different way, “MUSICA CHE RESTA”, music is the soundtrack of all couples, unfortunately for some couples, music is the only thing that remains (in Italian (LA MUSICA is the only thing CHE RESTA …… all laugh at the double meaning of the sentence). G = Let’s say that we are making steps forward from “Tell me never, that you will never leave me.” to “the sense of my days” so, slowly, we too, will make a disc of unpublished, trying to grow, under this point of sight. Q = Two questions, the first I wanted to know the other two unpublished, who wrote them, you talked about Ermal Meta who had sent you a song ….. the second question is: two months ago you released a CD called ÁMAME, produced by Emilio Estefan, which is not sold here, but which has sounds that are radically different from those that usually used in your records, I would say much more “urban” that is an interesting thing and I wanted to understand something more than this experiment. I = We did it on purpose. As Gianluca says it was an experiment. The fact that it has not been released on Italian platforms is why, because we have our audience here in Italy, we do not want to create confusion, ÁMAME was an experiment, a project, we had fun, because making reggaeton is fun, also because when you record, do nothing but dance, and it was nice, but it was a parenthesis, in a country, in fact it only came out in Latin America and in digital. G = However, to point out that it was Emilio’s idea, he wanted it strongly, also because there is a duet with Gloria Estefan that is very beautiful. PRESENTER = There is also a technical reason, if it may interest you. 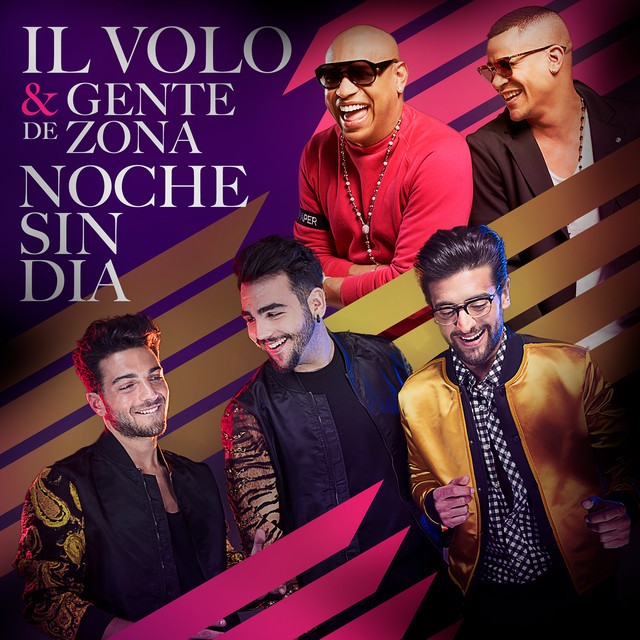 Until ÁMAME, the boys had a record deal with Sony Latin America and instead this record MUSICA is the first CD of the new relationship with the world that the guys have with Sony Italia. It was decided so, together with the Americans, for the simple reason that the guys live in Italy, and it is easier. The idea of making a CD with Emilio Stefan, was an idea that Sony American has proposed to the guys, to do an experiment, and they have enthusiastically joined. This CD was made and was distributed in Latin America , and this is how much. Q = But how did it go? G = It is important to say that we did not even have time to promote it, it came out in digital ….. also because there is Sanremo, there is the decennial, also on our part unfortunately there were other commitments so it remained so. I = The other unpublished songs are “VICINISSIMO” of Petrella Faini and “FINO A QUANDO FA BENE” by Tony Maiello. Q = I want to go back to the sounds that distinguish this CD, and talk also in relation to the live. You said that abroad you are known, appreciated, you have built your career on bel canto, so, these new things, how will they support those or will be completely excluded from the live? P = I connect to what was asked before, about travel, the tour, what people like. The North American public has its tastes, fortunately in 10 years we sang many songs, we made a list a few months ago and are about 120 tracks. For the North American public, we do a concert just for them, with different characteristics, we can say more classic. For Japan and northern Europe, such as North America. South America and Italy, on the other hand, are very similar, a more pop concert is required, so there will also be more lights, a more pop production. I = E can also say physics …..
Q = No, but you were fine, even as a child …. I wanted to ask each of you, a memory of the debut, at the time of Clerici, then of Sanremo as winners and today, how have you changed? Put yourself “out there”, then there is someone who has found love, who has found more than one, Ignazio, how are you? Q = Really, I ask you, have you told your musical evolution, tell it also as people, Gianluca, what did you think while we listened to the CD, you were completely absorbed. Can I ask you what you thought? I = Begin to answer the first question. At the beginning everything started as a game, it was work, but more a game. Now it has become a full-fledged work, but we retain the same desire, the same passion, the desire to play and always joke, like when we were younger. I think that love for what we do, over the years, has changed for the better. It started as a great passion, we arrived in Sanremo in 2015 with a great passion, and we will go back to that stage with the same great passion. For us, music has always been everything, what we wanted to do, make music from an early age. It makes us feel good, the music, we share from 2009 until today and we will have life. P = As for friendship, to live 10 years with those two, there must be a great friendship! It’s really hard. I = But not with Piero, with us two, he is a saint. P = I and Gianluca are saints immediately. We grew up together, we spent our adolescence together, sharing the same emotions, we can tell you in very few words that we really love each other. I = Luck then being in three, is that the faults, are divided into three. G = I was absorbed, because I watched you carefully. From the looks I understood that there were those who liked the CD, there were those who thought “not bad” and who instead ….. I noticed, we are aware that you cannot please everyone, I understand. I can also understand this prejudice that there is against us and that there has always been, from some of you, but it is right that there is, because it depends on personal tastes, there are those who appreciate and who are less and this is right. You consider that I, with my father, grew up with De Andrè, Gaber, Guccini (Italian singers), with a certain style of music that is completely different from what we do, from the national-popular. We are a television product, we were born and grew up with this kind of music and we will never change. But I must say that we must also try to understand, split even the personal taste, because it is subjective, and I must say that the three of us have completely different tastes, there are songs that I like less in this CD and songs that instead excite me. This CD excites me, above all “PEOPLE”, “ARRIVEDERCI ROMA”. Our dream is also to one day make a duet with Micael Bublè, what he does, a little resembles what we do, because he also takes up the tradition, the songs of Sinatra, Perry Como, Dean Martin, which moreover, are all Italians. There is nothing to do, our culture abroad, and very strong, musically speaking. A version of “TIME TO SAY GOODBYE” by Jason Derulo came out, so it means our melody is still strong. There is the audience that follows us, and this excites us, because at our age anyway, we are an anomaly to think that some boys of our age sing a genre that moves away from what our peers listen to. Our goal is to bring our tune to them. But if to be an anomalous youth means to sing a classical Hail Mary in front of the Pope, then we will do it all our lives. P = I just wanted to add, that we do not pretend to please everyone, also because there was someone who took 2000 years to be loved by everyone, and managed to be loved only by 20% of the world population. I = Compliments (and shakes Piero’s hand). Q = Gianluca told us the music with which he grew up as a child, but you two with which music have you grown? P = My dream has always been, indeed it is to sing one day, the first of an opera in an important theater. It is a personal goal of mine that I hope one day to be able to satisfy. I = And we on the balcony of honor. P = The other day I was at the Circolo Della Lirica in Bologna. These are the first steps I started doing, to test the response of opera lovers. G = It’s a beautiful thing. It would be nice for you, but also for the group. P = And so as a child I always listened to this kind of music. Let’s say that thanks to them I started to listen to other musical genres, otherwise I only listened to lyrical music. I = I’m a little particular, because I do not listen to much music, I listen to songs, I always loved Stevie Wonder, Brian Mcknight, Pino Daniele, as a child I also listened to Bocelli, Pavarotti, then growing up, I went on other genres. Q = You still have different projects and dreams, Piero in a theater, Gianluca you said that some songs, you like other less, to date, you do not want to do different paths, follow your personal dreams, outside of IL VOLO ? G = Dissolve now, it would be crazy! Q = I did not mean that you have to dissolve yourself, but to undertake something else. G = In the case of Piero, he could do it now, but talking about a record of mine or Ignazio, it would be crazy right now. Q = But your personal? Q = I mean, do not you want to pursue a personal career beyond them? G = In reality no, absolutely. Also because we are happy. We do our passion, all right, and as long as it goes well … get to 10 years, it’s difficult, but if we got there, we are surprised, we are happy, we hope to reach 20, 30. For now no, this desire, this need is not there, then it is clear, in life, anything can happen and maybe one day we will do some solo projects. I = It’s normal, however we have three different musical tastes. Il Volo I think it was the beginning of the spread of a kind a little forgotten and made by three young guys. It is normal that later on, whatever may bring prestige, bring something positive to this group, it will be done. And we are the first to hope that Piero can have his first opera at the theater, because in addition to being friends we are brothers and we wish good for each other and therefore the hope that Piero can realize this dream of his, is also ours. This has always been our goal, the one that brings prestige, which brings positive to the group, we do, without thinking, it’s only, in two or three, we do not think about it. We are IL VOLO. PRESENTER = Before giving space to tours in Europe, America, Japan, everywhere, in Italy waiting for you in Matera, there will be two special shows, journalists will be invited, there will be dates in the amphitheaters and then there will be this closure in Verona, what does it mean for you to return to the Verona Arena in September with which you will close the Italian tour? I = Surely the Arena di Verona is not a goal, but a stage that appeals to all artists. The Arena of Verona gives you an emotion that few stages and theaters, amphitheatres, and sports halls can give you. It will be a great honor, because anyway, the Arena is getting closer to what we are, because it is a totally classic environment, but that has opened the doors to pop and all kinds of music, so it is the perfect combination for us and for our musical genre. Now let’s leave the word to Michele Torpedine who will tell you about Matera and the whole tour. MT = So, Matera is practically the next special PBS, the famous special with which, in America, thanks to them, start the pre-sales for concerts. Moreover, this year we start again from RCMH in New York, as the first date, and we have been coming, as always, from eight years now, in the main American cities. In Matera we will do two dates at the end of May and then on 1 June there will be the PBS event. We have the full support of the Ministry of Culture and will be the first event since the official opening of Matera a few days ago. Q = You are interpreters, but have you ever written songs? Some text? G = Yes, above all Ignazio, come on, Ignazio speaks, it is you who writes. P = When he is in love, he is inspired. I = I like to write, I do not think to write for IL VOLO or anyone else, I write because it makes me feel good, it is also a form of expression, and it’s nice to write your own things. But for us we never thought about writing anything, also because we have to think, that there are those who do it better than you, so it’s better to let others work. PRESENTER = Was this the last question? Yes. Partly a new IL VOLO with the CD, MUSICA, always trying to be better year after year. I = However, we would like to thank everyone for always being here for our appointments. G = Also because we know each other better, because some of you, we have never met them. P = Also because in previous meetings we were afraid that they were just questions about Sanremo and not about other projects, so thank you for your interest. I = Thanks to Sony, which always supports us in our projects, it is supporting us in this MUSICA project, a new collaboration has begun. Thanks so much for everything. I am speechless, after this beautiful press conference. The first thing that left me amazed but in a negative way, is to understand that the American tour, so eagerly awaited by you, seems to be postponed to 2020. For a moment I thought of all of you, who with love expected to discover the dates of the various concerts. I understand your disappointment and I think I understand that the unexpected participation at the Sanremo Festival has postponed everything. Apart from this news, the whole press conference was beautiful. The boys were very professional, but they also talked “with heart in hand”, always polite and witty. Even journalists, they have asked very pertinent questions and from the impression, it seems that IL VOLO has been appreciated by journalists, now we will see what they will actually publish in the newspapers. Of course after seeing a conference like this, I wonder how people can still, and journalists, say or write that they are “mounted” guys (thinking they are above others), is nothing more false. They are very humble, mature boys, now young men. I loved translating all this and I hope you will appreciate it, beyond the bad news.